Now that I’ve started kegging and transferring my hoppy beers in a closed system under Co2, my hoppy beers have improved by leaps and bounds, both in terms of quality and longer term stability. So, now that I’ve gotten that hurdle behind me, what’s next? Dialing in the details! Right now the biggest detail for me is finding a house yeast to use with my ales. Most professional breweries have a go to yeast that helps define their flavor profiles for their ales. Anything from Sierra Nevada has a somewhat familiar flavor due to the Chico yeast strain that they use. Same with Stone, Lagunitas, and so on, all have a house yeast that helps define them. I’d like to dial in the White Pointer flavor profile, and maybe start harvesting and reusing yeast, which is something I’ve never done. I’ve used a bunch of different yeasts over the past few years and some have been great, some not so much. The Chico strain and other American yeasts I’ve used are fine, but I like to have some subtle esters, so those are out. For English yeast, I loved the convenience of Safale S-04, but there was a hint of tartness that I just wasn’t fond of. I really liked WLP 007 Dry English Ale and it was almost my first choice until I used Conan. The 007 is clean, attenuates well, clears on the beers that I care about clarity enough to use gelatin on, and has just a hint of ester aroma and flavor. 007 was great with my hoppy beers, but Conan edged it out. I use the DIPA yeast from Omega which is the Conan strain found in The Alchemist Heady Topper. This stuff is steroids for hops and lends an awesome peachy/apricot/pineapple note to the beer. Despite what others have said about the strain, I haven’t had any attenuation issues with Omega’s version of it, usually getting around 80%. I also really enjoy the smooth palate that this yeast helps create, but it remains drinkable. My only complaint with this strain, and I haven’t used it on a maltier style yet so maybe I’m wrong, is it seems a bit one dimensional. The several beers I’ve used it on all have a Heady Topper-esque flavor to them. Now take that criticism with a grain of salt since most of my hoppy beers tend to be lighter colored “Northeast Style” beers anyway. As much as I like Conan’s flavor profile, I’m concerned using it as a house yeast may be a bit one note. The other issue is Conan’s low flocculation, though this is a much smaller concern for me. I actually like my hoppy beers to be hazy. The more fruit juice looking my APA’s, IPA’s, and DIPA’s are, the better in my opinion. I don’t brew hoppy styles exclusively though, and there are certain styles that I’m not sure I’d use Conan on. I’d be interested to see how Conan works in an American Amber or Imperial Red for example, two styles that I feel look better clear. That being said, Conan is my favorite yeast that I’ve used so far and is my leading candidate for being my house yeast for 90% of my beers. This brings me to my other option, and I just used it for the first time: Wyeast 1318 London Ale III. I used it on my most recent version of my Serrated Summer Ale (Brew Day post coming soon!). This beer is in primary, so I have no personal experience with it, I can only go from what I’ve heard until I keg my summer ale and get drinking. Rumor has it that London Ale III is the strain that Hill Farmstead uses. Anyone who’s had their beer knows why I’d want to emulate them. Their hoppy beers are usually light colored, cloudy, have great hop flavor and aroma, and are smooooooooooth. I’m talking smooth like drinking a glass of OJ. The mouthfeel is so soft, it just makes these beers incredible. 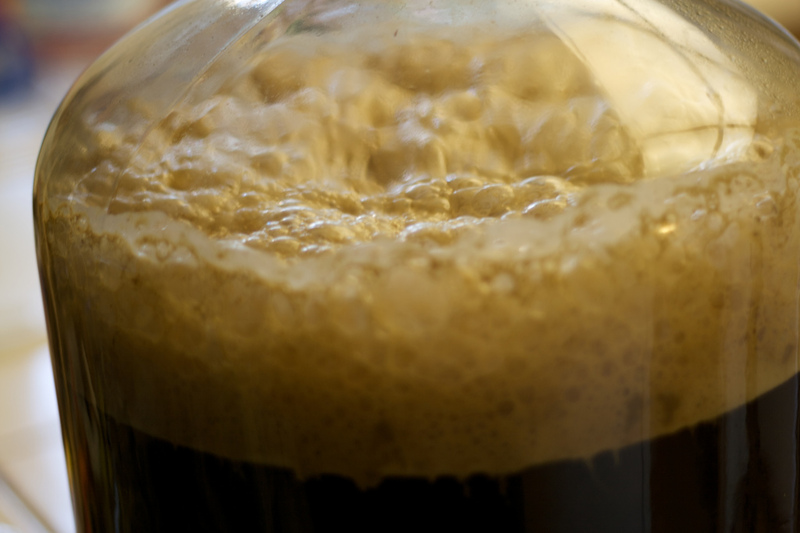 Now of course it isn’t just the yeast that does this, its water and brewing technique as well, but the yeast is an important contributing factor. People who have used this yeast report that it accentuates hop flavors well, is clean with subtle esters when fermented at lower temperatures, and has mid range attenuation leaving a creamy body. That all sounds exactly like what I’m looking for. I’ve heard that, as with Conan, clarity can be an issue, but the vast majority of the time I don’t care about that. I’ll be updating this post with my thoughts on London Ale III and how I feel it stacks up against Conan once I’m able to drink my summer beer enough to form an opinion on it. I’m considering brewing a small batch of IPA and split it between the two yeasts to do a proper side by side comparison, but I’ll make that call after seeing if my summer ale is enough to make that judgement. Update 06/25/15: I’ve had a decent amount of my beer, Serrated Summer Ale, that used the 1318 London Ale III. I have to say, I’m a big fan of it. All of the things that I read about it are pretty true. The yeast left what I can best describe as a “roundness” in the body and flavors. The yeast, combined with my malt bill and water treatment, left a nice silky mouthfeel. It attenuated at 77% so that’s pretty good for a beer that I mashed at 154 degrees. The hop flavors and aromas of the beer popped nicely. The beer left some residual sweetness, but it was pleasant, not at all cloying. The ester profile was subtle, with some slight fruitiness that blended well with the hops I used. I fermented the beer in the mid 60’s, so the yeast stayed pretty clean. I wouldn’t be afraid to let it ferment warmer in the upper 60s. All in all I’m very pleased with it. I can’t say for sure that this is the yeast used in beers from Hill Farmstead or Tired Hands like the rumors suggest, but its at least a VERY similar strain. The question is, how does it stack up against Conan, and which would I use as a house yeast? Well, more research is needed for me to commit entirely to one or the other just yet. In reality, I think I’ll need to brew a split batch of APA or IPA and do a side by side with these yeasts. Both Conan and 1318 complimented the hops well in the beers I’ve used them in. So you can’t go wrong with either of these in a hoppy style. I routinely get around 80% or more with the Omega DIPA Ale version of Conan and I got 77% with the 1318. If brewing a bigger beer, I’d want to maybe use some simple sugar to help the 1318 out. Conan is definitely the more expressive yeast, throwing off some peach and apricot flavors and aromas. It’ll be be hard for me to go away from this yeast on my IPA’s due to the fruity esters that play with the hops so well. The 1318 is more subtle for sure, fruity, but not like the Conan. I think you could probably get a more diverse array of flavors with this yeast though since everything with Conan will have that/peach apricot profile to some degree. Both yeasts provide a soft mouthfeel, with the 1318 just edging Conan out here. The beers that I’ve used Conan on seem to have a bit more “pop” to them though. Both yeasts leave a pleasant sweetness to the beers I’ve used them in as well. Both of these yeasts are winners in my book and I’d feel confident using them both in an wide range of beers. I’m not sure I’ve settled on one or the other being a “house yeast” for me, if I even decide to go that route. I need to use 1318 a few more times, and I really need to do a side by side. I hope this write up helps anyone deciding to use either of these yeasts, you certainly won’t be disappointed in either! UPDATE! I decided the only way to truly decide between these yeasts was do do a side by side test. Read about my experiment HERE! I’ve noticed that the Part 2 Side by Side tasting gets fewer clicks, so in the interest of streamlining info, here’s Part 2 if you don’t feel like clicking the link above! In my never ending quest to dial in my recipes, I’ve been trying to decide on a house yeast for most of my ales. I’ve used both Conan and London Ale III and really liked what both have to offer, but which yeast better fits my needs? If you read my Part 1, you’ll see my thoughts on both of these yeasts. Well, The only way to determine which yeast I like better for sure is to do a side by side comparison! I took a pale ale recipe that I haven’t brewed yet, but had been meaning to. I did a 3.5 gallon batch. My water profile was typical of my pale ales, heavier on the chloride with a smaller gypsum addition. After the boil and hopstand were complete, I split the batch between two carboys. I pitched London Ale III in one, Conan in the other. Both batches of beer are fermenting at around 66 degrees. I’ll bottle the two batches at about the two week mark, give it a week to carb, and then toss some in the fridge to test. I’ll post back here with an update as soon as this experiment is over! Update 08/08/15: I bottled both batches yesterday. I was surprised that both batches finished at 1.006, I had expected the Conan batch to finish just a bit dryer. Both samples already smelled and tasted great, It’s going to be hard to decide which I like better. I plan on waiting a week to carb and then putting the bottles in the fridge for a day. I’ll then do the side by side! Update 08/13/15 Tasting: Here’s the moment I’ve been waiting for! Let me start by saying that I really like both of these yeasts. They each have strengths and you truly can not go wrong using either. That being said, I have to say that London Ale III is my preferred yeast between the two. The appearance of both beers was pretty close as you can see in the picture above. The London Ale was just a hint more hazy and bright, the Conan just slightly darker and clearer. 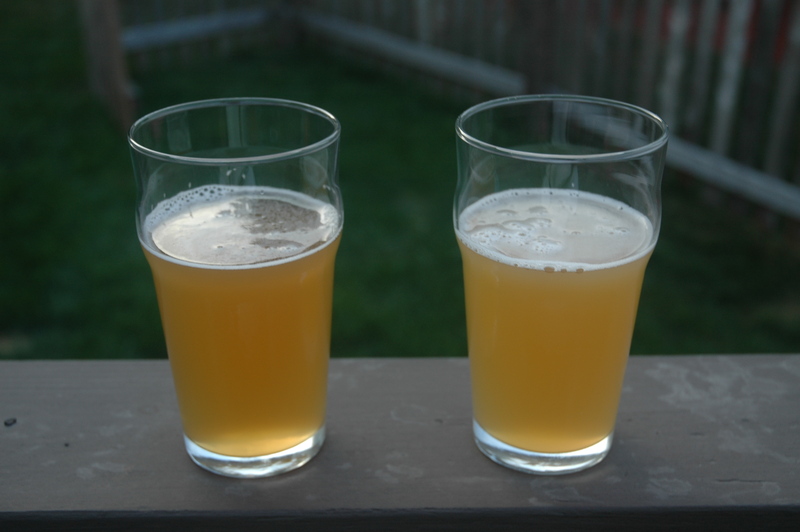 Both were pretty looking beers and anyone who reads this blog knows I enjoy hazy hop forward beers. Both beers smelled really nice. The London Ale had an intense citrus aroma, more orange than grapefruit, with maybe a bit of pineapple. There was also a bit of pine as well as some English ester aroma. A really good smelling beer for sure. The Conan had a more peachy and apricot aroma that blended with some citrus and pine. This isn’t surprising as Conan is famous for that apricot/peach profile. The aroma of both beers were fairly intense, and its hard to say which was more appealing. The taste of these beers weren’t too far apart, but I slightly preferred the London Ale III. I feel that both yeasts accentuated the hops and malts well, but I like that London Ale III was just a bit more neutral. Don’t get me wrong, the London Ale had some nice subtle ester character to it, but I feel it was the more neutral of the two yeasts. This will let the individual ingredients of the beer shine though in my opinion. Conan was slightly bolder in flavor. The hop profile of the beer was the same obviously, but Conan added that peach/apricot note, while the London Ale was more citrusy. The flavor of the London Ale beer seemed rounder to me if that makes any sense. The bitterness faded quickly, the citrus from the hops was there, and then it had a slightly sweet, juicy finish. The Conan’s bitterness seemed to linger just a bit longer and its flavors seemed sharper. Conan also left some nice sweetness in the finish as well. The mouthfeel of these beers where both really nice, but I have to give the edge to the London Ale III. This beer just seem so soft. There’s a creamy feel that London Ale gives the beer that Conan, while close, just falls slightly behind. Conan was a bit crisper, while the London Ale III had that roundness I mentioned previously. Like I said earlier, you really can’t go wrong with either of these yeasts. For my tastes, London Ale III just barely wins over Conan. Conan will likely make for a sharper, bolder beer, while London Ale makes a super balanced, round, and juicy pale ale. I also feel like the London Ale would work better in a wider variety of beers, so if reusing yeast is a concern then that may also impact the decision. All in all this was a really fun experiment to try. I really like both of these yeasts, and a direct comparison was the only way I was going to be able to choose between them. I encourage anyone who is considering these to try this experiment as well. Taste is subjective, so your opinion may vary from what I found here. I hope this post helps any fellow brewers who are looking to dial in their recipes! This entry was posted in Articles and Opinions and tagged 1318 yeast, Conan yeast, Hoppy by White Pointer Brewery. Bookmark the permalink. Thanks for reading! As far as my water profile goes, I usually use about half tap water and half distilled. For my hoppy beers, I’m usually shooting for somewhere around 200ppm Chloride, 100 to 150 ppm for sulfate, and Calcium usually winds up around 130 to 150ppm. The other minerals are fairly negligible. This profile has been based on my attempts to emulate breweries like Hill Farmstead, Treehouse, and Trillium. Those brewers are making, in my opinion, the best hoppy beers in the country right now. My water profile is one component in trying to get near the amazingly soft mouthfeel and smooth bitterness those guys can achieve. The water profile I use has been mostly based on trial and error, and reading what some other guys have done. I don’t have any insider knowledge or anything like that. Also I’m sure its not going to be the best way to go for all styles, it’s just what I tend to use when I’m trying to brew like those Northeast guys, and that tends to be most of my hoppy beers. This was cool to read. I’m using Conan for the first time right now. It’s in the fermenter and in the style of Tree House. I never though about London Ale yeast as I’ve started looking at different Belgian yeasts to try and crack the code. I wish I had time to do side by sides like this. Thanks for reading and I’m glad you found it interesting! It’s pretty rare that I brew for the sake of testing ingredients, but I felt like the right yeast was one of the last components that I really needed to nail in my pale ale recipes. I couldn’t decide if I liked Conan or London Ale III better so I figured this was the only way I’d know for sure. I’d say give it a try using the same recipe that you’re using Conan on now and see what you think! Right now I’m dialing in a few recipes as my house recipes. Although I have a SMaSH IPA that we’re almost finished drinking that I’m hoping will benefit from a livelier tasting yeast. I used CalAle and really want to try it now with LA3. I’ve found 1318 to give a decent fruity ester taste fermented around 65 to 68 degrees, definitely more expressive than Cali Ale yeast. I’m tempted to let it get to 70 degrees and see what happens. Did you build a starter with either or both 1318 and Conan? If so what steps did you follow? How did you come to the 75% 2-Row, 8.5% Oats, 8.5% Wheat, 5% C15 malt bill? I’ve been wavering back and forth on what to use for my next batch (hoppy honey blonde) malt bill, right now considering 82% Golden Promise, 10% White Wheat, 5% Oats, 3% Honey malt. Thanks for the article, I’ve been considering using either of these yeast for my next few batches and your articles helped me decide on 1318. Going to try it out with a hoppy honey blonde first (malt bill above)! I didn’t build a starter for this split batch just because of the small batch size for each, the yeast in the packs were enough. I came up with the malt bill after reading a number of other brew blogs out there, and seeing malts used by some of my favorite breweries. Trillium in Boston, for example, is pretty forthcoming with their ingredients. I’ve dropped the oats in most of my pale ales, though some will still use it. I had used oats for mouthfeel, but I feel that a mix of wheat and carapils does the trick for me. I love the grain bill for your honey blonde, sounds good! 1318 should pair really well with those malts and American hops. I’m a big Golden Promise fan too, its a great base malt! Oh cool! Can you link me to any of that info on Trillium? I love their beer. It gives hops and malts, but not percentages of anything. Still, its got some good info. Do you recall if either of these beers cleared over time? I’ve used conan more than 1318, but both are great yeasts. My experience is that it takes conan a while to condition out, but you’ll be left with a nice clear beer (which i prefer over 1318). However, I have not held onto 1318 long enough for it to clear up. For young beer, I prefer 1318. For bright beer, I prefer conan. With this beer beer specifically, I believe the Conan cleared more than the 1318, though neither were around long enough to have the time to drop clear. Generally that’s been my experience with these yeasts on hoppy beers. Conan, in my experience, will eventually drop to a minimal level of haze given enough time, though it takes a long time in my highly hopped beers so those rarely stick around long enough to clear. I’ve had 1318 drop out in a pale ale where I didn’t use a crazy bunch of hops or wheat/oats, but the haze typically sticks around longer in hoppy ales, and in my highly hopped IPAs and DIPAs, it never clears much at all. In less hoppy styles, I’ve had 1318 drop out crystal clear though without a lot of time, so it just depends how you use it.